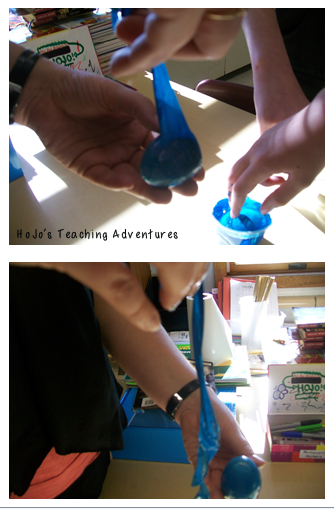 Maybe if I kept up with blogging I wouldn’t be finding a science experiment that we did last spring still on my camera. I’ve seen this one all over the internet, and I remember doing it when I was in school – but I still think it’s a fun reminder to see it again! 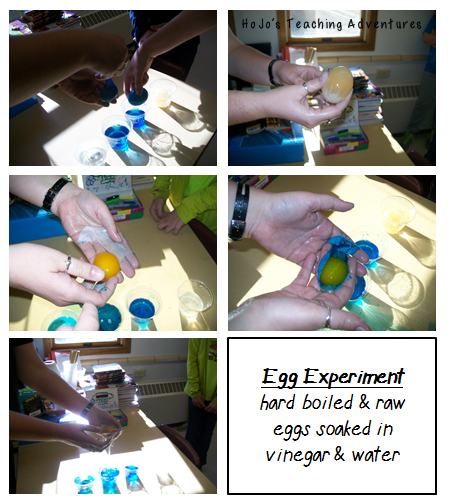 We had two hard boiled eggs – one in vinegar and the other submerged in vinegar with blue food coloring added. Then we had another two eggs that were raw. We left them submerged for about two weeks. The kids couldn’t get over how “see through” the eggs were! The students enjoyed pulling the “skins” off of the eggs. If you’d like to read another blog with even more information about this experiment (including videos!) – check out E is for Explore: EGG-cellent Experiment. 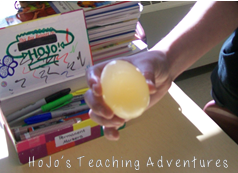 Very cool experiment HoJo! Glad you found those pics & posted!